The most popular tradeshow promotions - Get your corporate name or public awareness message out there with the most popular giveaways. Enter coupon code - CAT19 - in the Coupon/Promo box in your shopping cart on the 4imprint website. Personalized pens, coffee mugs, tote bags, sports packs and t-shirts continue to lead the way in generating name and message, and brand recognition and 4imprint has hundreds of styles to choose from. Innovative promotional products - If you're looking for new ideas in tradeshow promotions, 4imprint is the right catalog to shop. From tradeshow displays, banners, totes to flash drives and flashlight/tool kit combos, they have hundreds of new and exciting ways to get your name in front of customers. Sports-themed trade show promotional products - Bring a sports theme to your next promotion with an imprinted golf ball, imprinted baseball jersey, rally pom-pom, or auto racing fan kit. Whether you're looking for a promotional imprinted item for a team or sports event, or just want to bring the feel of the big game to a corporate event, 4imprint has dozens of choices waiting for your logo or message. Religious and charitable event promotions - Spread the word about your church, synagogue, mosque or charitable group with custom imprinted gifts from their huge catalog. Or create favors for Bar or Bat Mitzvahs, Christenings or other religious milestones. Charities and health fairs are a natural match for the hundreds of affordable, attractive promotional products they have in stock. Food and beverage trade show promotions - From personalized fortune cookies and chocolate bars to personalized water bottles, coffee packets and lemonade mix, treat your potential customers to a sweet treat with custom imprinted tradeshow promotions featuring your logo, name or message. Trade show supplies - From catalog holders to display banners and interlocking floors for your tradeshow booth, 4imprint also has the set-up and display supplies you need for a successful show experience. 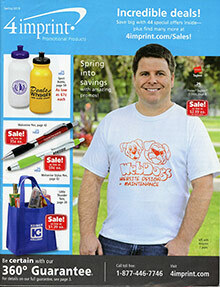 For thousands of choices in custom imprinted promotional products, let 4imprint work for you.